Comprehensive Cardiology in Langhorne, PA had a vision of improving both financial and clinical outcomes by creating a community health network. They needed an experienced partner that offered flexible, robust revenue cycle and clinical solutions. 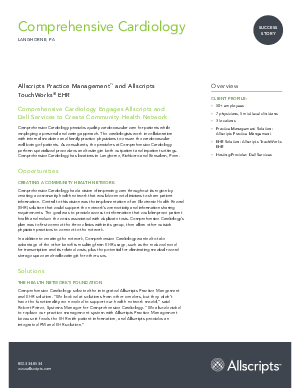 Read more about Comprehensive Cardiology’s journey, and how Allscripts solutions have helped them save time, increase efficiency, reduce costs and make their vision of a community health network a reality.